This is the cover of one of my old fanzines, DEEP PURPLE MAGAZINE issue 17 (October 1980). 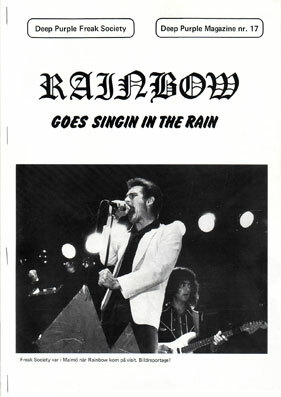 The story behind it was that Rainbow played a show in Malmö a week prior to the famous Caste Donington show in August that year (last concert with drummer Cozy Powell and singer Graham Bonnet), and after about two thirds of the set the rain was pouring down. The band abandoned Don Airey during his solo and never came back, and one of the final improvisations from him that night was a snippet of the song “Singin´In The Rain”. All in all, a fantastic show, with Ritchie Blackmore in top form (and mood). The whole band was great. “Stargazer” was played, a far better version than the one at Donington. It was my second Rainbow show that year and the only outdoor gig I ever saw with Blackmore. Author Martin Popoff is doing a book and one of the things I rambled about earlier today for his Q&A was about this night. It was one of those great nights that can never be forgotten.